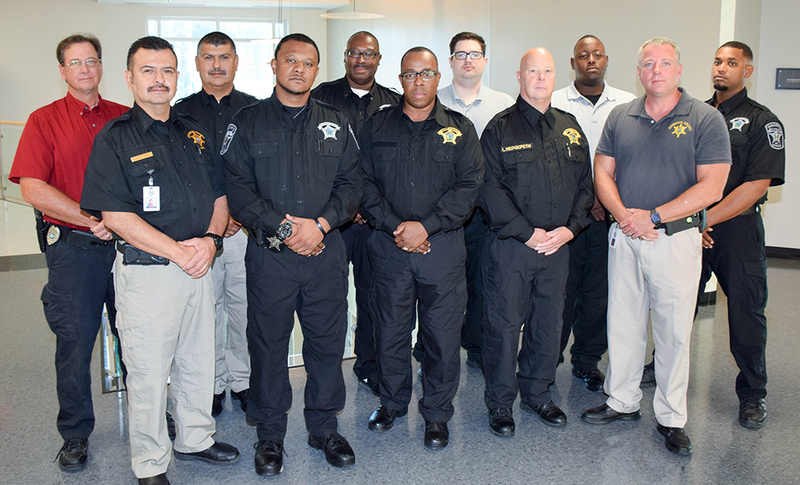 Students from Nash County, Franklin County, Vance County, and Johnston County Sheriff’s Offices recently completed Detention Officer training at Nash Community College. The certification includes 179 hours of training designed to train qualified participants to function as officers in detention facilities. The course is governed by the North Carolina Sheriffs’ and North Carolina Criminal Justice Education and Training Standards Commissions. Students who completed the certification program are, from left: front row – Bernardo Gonzalez, Derrick Brooks, Robert Peace, Larry Hedgepeth, Michael Carson; back row – School Director Reuben Crumpton, Ramon Gonzalez, Gary Durham, Russell Hight, Joshua Terry, Chase Strickland.